A system, almost always a coordinate system, used to describe the position, and also the velocity and acceleration, of an object is called a frame of reference. 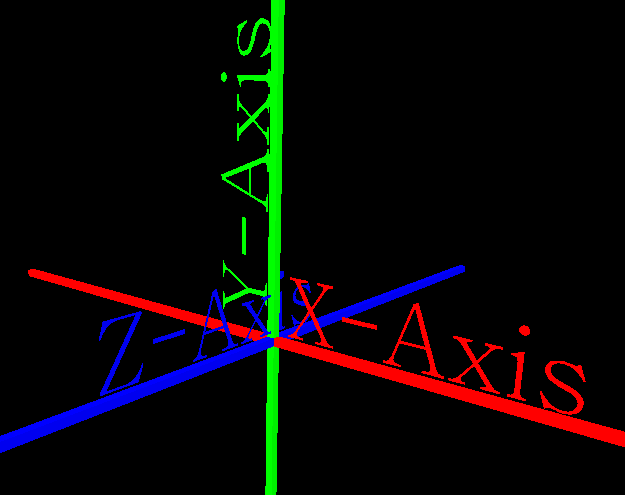 Below is a picture from a VRML world showing an (x, y, z) coordinate set of axes. This coordinate system could be used to locate and judge the motion of an object. This coordinate system, therefore, could be used as a frame of reference. If you are in a room, very most likely you use the walls, floor, and ceiling of that room as a frame of reference to judge the motion of objects in the room. These walls and the floor and the ceiling form planes that lie parallel to an (x, y, z) coordinate system which one might imagine in the room. 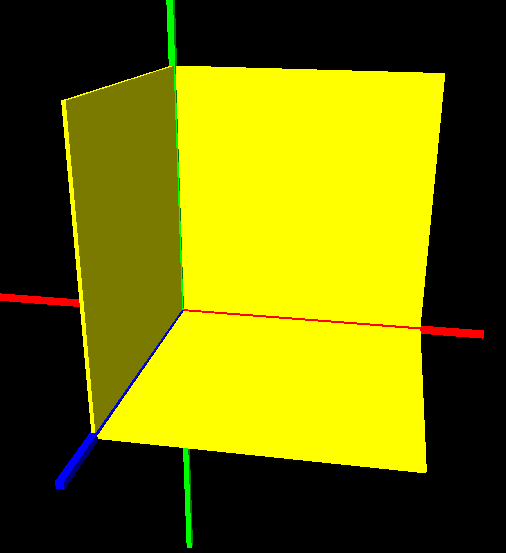 It is especially easy to see this (x, y, z) coordinate system located with its origin at one corner where the floor and two walls meet. For example, if a ball rolled across the room, you would know that it was moving because you would see its position change relative to the floor or walls. One would, very most likely, believe that the walls of the room were standing still, and, since the ball was changing position against this backdrop of still walls, one would think that the ball was in motion. In that way we would use the frame of reference of the room to determine the motion of the ball. In a like manner, if one was in an automobile, and a ball was rolling around on the floor, one would use the frame of reference of the interior of the automobile to judge the motion of the ball. The interior of the automobile is, after all, quite a bit like a small room. Although its walls, ceiling, and floor are not as flat or rectilinear as that of a normal room, one could still imagine an (x, y, z) coordinate axes attached to it somewhere, most likely the floor, and one could use this (x, y, z) coordinate axes to locate the ball. Now, let us think of the automobile simply as a room that might be standing still or that may be in motion. When it is in motion, it might be traveling at a steady speed down a straight path; it might be speeding up or slowing down; it might be going around a corner. Therefore, a frame of reference can be in motion, and that motion can be of several different types. Anyone who has ever taken a ride in a car has been in a moving frame of reference and has experienced the several different types of motion through which this frame can move. Actually, frames of references are classified into two types depending upon how they are moving. Those two types are called inertial and non-inertial frames of reference. An inertial frame of reference has no acceleration. The law of inertial holds in such a frame; no fictitious forces arise. Click the above link to learn more about inertial frames of reference. A non-inertial frame of reference is an accelerating frame. The law of inertia does not hold in this type of frame, and fictitious forces arise. The above link contains more information on non-inertial frames of reference.